As of today the number of seats sold for the bus has reached 27. All of the passengers so far are from Perth. Thanks to everyone there who have put together more than 4500aud towards the purchasing of a second bus. 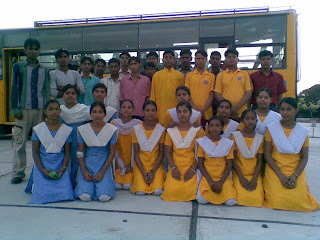 On the first of November 60 of the students went on tour for five days around Rajasthan visiting Udaipur and Mount Abu. We took our buses, a cook and his helpers and hit the road. The students had a ball, when you consider that some had never left their local area it was a pretty big adventure. The highlight was boating on paddleboats, when you live in the desert you don't have a lot of opportunities to go out on the water!!! Sorry that there are no photos. Some of the teachers took photos but they haven't had them processed yet. It will come. Thanks again and get your tickets for the bus. Finally the school is opened!!! It isn't really fully ready, some finishing will be done between classes but the time had come to take the plunge. 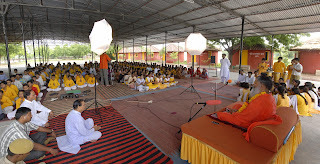 The opening ceremony was attended by Swamiji and a lot of parents. There were some great performances of plays, singing, dancing, yoga and speeches. In short it was a lot of fun. The building is great, the classrooms are spacious, airy and light, the atmosphere is peaceful, pretty much a perfect place for learning. Some of our students going for competition. The two girls are going to the state athletics tournament having between them won the district titles in triple jump, long jump and hurdles. 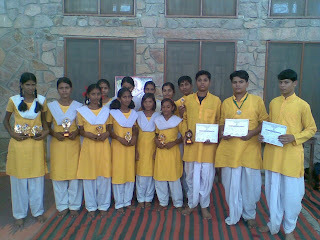 The second picture is some of the students with their trophies for athletics, judo and singing. The third picture is the team that went to the state judo championships, 23 in total of which 13 were from our school. They had a great adventure, didn't win much but didn't lose in the first rounds either and one of our boys got a bronze medal in his division. It is so beautiful to hear the morning singing of prayer and the national anthem come floating across the breeze at 0830. For all those who were a part of raising money for the purchase of the school bus congratulations as according to our calculations last week we past the amount required. Until date we have received 511, 250 rupees which is approxiamately 15492 aud or 9300 euros. The cost of the bus and it's initial repairing came to 505, 000 rupees. Thanks to everyone for their support which when far beyond our expectations and hoping that you will enjoy being a part of our school in the future. We are now continuing with raising money for another bus as enrollments have far exceeded our expectations and it is pushing the limits of how many people can fit in our current vehicles. So please share our site with others and keep in touch. Once again thanks and congratulations to all particularly everyone at YIDL Perth, the friends of Gay and David McKinley in Sydney and those who helped from Luxembourg, Japan, Czech Republic and the US. Our classrooms are simple. The teaching should be excellent. It is well overdue but the final touches are being added to our new school building at least half of which should open by the end of September. It is simple, spacious, well ventilated and full of light. Although it is not an architectural marvel it is so practical that it will be heaven to teach there. We are so much looking forward to getting the students inside and out of the current building where they are literally sitting in the doorways. It is planned that the building will have a double use, in the morning acting as a school and in the afternoon there will be College classes (Bachelor of Arts and Bachelor of Science). In that way we can offer our students the chance to have quality education not just until Secondary level but right through until they have a degree. 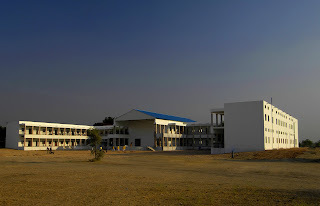 There are 22 classrooms, 3 science labs (physics, chemistry and biology), a library, a computer lab and a multi purpose hall in the building. August 15th is Independence Day in India, the day when British Rule ended in 1945. It is celebrated in all schools throughout the country and ours is no exception. Always there is a march past, raising of the flag and speeches remembering the sacrifice of the freedom fighters. Our celebrations also include a yoga display, traditional dances and a volleyball match between the staff of the school and a team made up of our foreign volunteers (we count it as an "International Match"). It was a lot of fun and a great atmosphere all day. 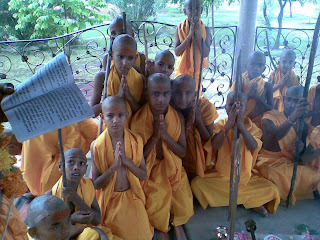 On the day of Gurupurnima some of the boys took the initiation of Gurukul Pravesh - entrance into the years of education. 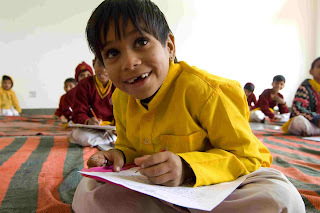 It is an ancient tradition going back thousands of years that when the boy reaches the age of seven they are sent to the Gurukul to study. The ceremony involves shaving of the head, fire ceremony and the giving of unsewn cloth to the new initiate. It is a beautiful ceremony that goes for the whole morning. At the end of it the freshly initiated student comes to their Guru and is given a mantra which they should use throughout their studies. When the head is shaved a tuft of hair is left on the crown of the head which is tied in a knot. This is to stimulate the brain, help maintain concentration and improve memory. It is not compulsory for the students to take the initiation and is given only with the wish of the parents and the student. In the photo you can see the boys sitting at the fire during the ceremony. 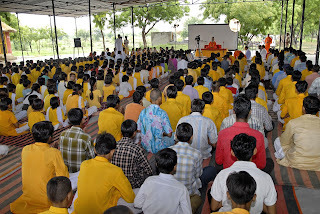 Today Swamiji gave a lecture and the students were singing bhajans in Jadan.